Difference between revisions of "Expansion tectonics"
[[File:CrustalAgeMapNOAA.gif|thumbnail|500px|The Crustal Age map from NOAA is considered by expansion tectonics as the most important geological map in modern geology]]Expansion Tectonics is a geology-based tectonic theory that is used to describe, model, and reconstruct the large-scale evolution and assemblage of Earths tectonic plates on an Earth that has been slowly gaining in size and mass over billions of years. This theory, and associated modelling studies, extends in time from the early-Archaean–some 4,000 million years ago–through to the present day and is readily extrapolated to the future. Modelling studies demonstrate that changing configurations of the supercontinents, breakup of the Pangaean supercontinent, formation of the Earth’s modern continents, as well as sympathetic opening of each of the modern oceans is progressive, predictive, and evolutionary. 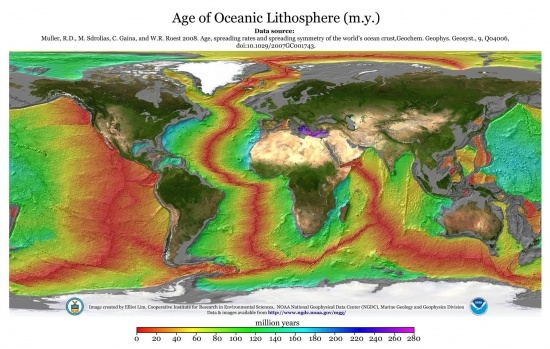 [[File:2008_age_of_oceans_plates.gif|thumbnail|500px|The Crustal Age map from NOAA is considered by expansion tectonics as the most important geological map in modern geology]]Expansion Tectonics is a geology-based tectonic theory that is used to describe, model, and reconstruct the large-scale evolution and assemblage of Earths tectonic plates on an Earth that has been slowly gaining in size and mass over billions of years. This theory, and associated modelling studies, extends in time from the early-Archaean–some 4,000 million years ago–through to the present day and is readily extrapolated to the future. Modelling studies demonstrate that changing configurations of the supercontinents, breakup of the Pangaean supercontinent, formation of the Earth’s modern continents, as well as sympathetic opening of each of the modern oceans is progressive, predictive, and evolutionary. Expansion Tectonics is a geology-based tectonic theory that is used to describe, model, and reconstruct the large-scale evolution and assemblage of Earths tectonic plates on an Earth that has been slowly gaining in size and mass over billions of years. This theory, and associated modelling studies, extends in time from the early-Archaean–some 4,000 million years ago–through to the present day and is readily extrapolated to the future. Modelling studies demonstrate that changing configurations of the supercontinents, breakup of the Pangaean supercontinent, formation of the Earth’s modern continents, as well as sympathetic opening of each of the modern oceans is progressive, predictive, and evolutionary. Expansion Tectonic theory builds on the largely historical Expanding Earth theory which was initially developed during the 19th and first few decades of the 20th century. This historical theory was extensively promoted by the Emeritus Professor Samuel Warren Carey of the University of Tasmania during the 1950s, and was modeled by Klaus Vogel of East Germany and Jan Koziar of the Wroclaw University, Poland during the 1980s. The theory was unceremoniously rejected by science during the mid-1960s in favour of plate tectonics, based on limited and inconclusive palaeomagnetic studies of ancient Earth radius. Since that time there has been a considerable amount of modern global observational data collected from all fields of the Earth sciences which are now available to thoroughly test and evaluate all tectonic theories. Apart from its implicit assumption of a constant radius Earth, there is very little data in conventional plate tectonics that is incompatible with the largely historical Expanding Earth theory, and vice versa. It is the same global data gathered about the same Earth—just interpreted differently. Rather than artificially constraining modern plate tectonic observational data and plate tectonic thinking to a constant-sized Earth—the current dogma—modern scientific methodology insists that this new global observational data be tested to see if the data, and hence the basis of plate tectonic theory, are not better suited to an increasing radius Earth scenario. The historical terms Earth Expansion, Expanding Earth, and similarly Growing Earth, refer to changes to the shape and size of the Earth, as well as motions of the various crusts on an Earth whose surface area increases with time in sympathy with an increase in Earth mass and radius. These terms are synonymous but now largely unpopular. To avoid confusion with these redundant theories Expansion Tectonics is used to encompass each of these terms in relation to modern observational evidence. The term Expansion Tectonics was first introduced in 1995 by Australian geologist Dr James Maxlow and subsequent quantification of this new science is based on an extensive range of modern global tectonic data. It is unfortunate that science does not encourage research into this alternative proposal whereby the increase in surface areas of all ocean crusts and movement of the continents is a direct result of an increase in Earth mass and radius over time. Because of this lack of encouragement, rejection of the historical Expanding Earth theory in favor of plate tectonics should not be perceived as rejection because the theory was wrong, it is only the proffered historical mechanisms behind the theory that may have been lacking in credibility. Investigating the extensive range of modern global observational data on anything other than a constant radius Earth model has never been done before. Because of this lack of inquiry, scientists and industry have been deprived of a valuable scientific basis to thoroughly test and independently evaluate the merits of this modern global data. The reason why this investigation and modelling has not been done before is simply because science has been stereotyped into firmly believing that Earth radius has always been the same size as it is today, based originally on very tenuous geophysical evidence. Because of this insistence, conventional plate tectonics then considers that continental and seafloor crustal development has been a random, non-predictive, and somewhat catastrophic process. It is unfortunate that science is firmly conditioned into accepting this belief and insistence, as well as accepting any shortfalls this insistence imposes on the global data, without further inquiry. Many scientists have demonstrated that an Earth increasing its size over time is perfectly feasible and provides a better explanation for many geologic observations than does a fixed-radius Earth model. Researchers, such as Lindeman 1927, Hilgenberg 1933, Brösske 1962, Barnett 1962, Dearnley 1965, Owen 1976, Shields 1979, Schmidt and Embleton 1981, Vogel 1983, Luckett 1990s, Scalera 1988, Maxlow 1995, 2001, and Adams 2000s, have each constructed models of the ancient Earth and shown that all of the present-day continents can be neatly assembled together on a fully enclosed smaller radius Pangaean supercontinental Earth some 250 million years ago. In contrast to conventional plate tectonic reconstructions of past supercontinental assemblages, modern global geological mapping of the oceans and continents is used exclusively in Expansion Tectonic studies to recreate and model the entire 4,000 million years of Earth’s known geological history. Spherical small Earth models constructed by Dr James Maxlow represent accurate models of precise continental and seafloor crustal plate assemblages extending from the early-Archaean to 5 million years into the future. This global geological mapping has only been available since 1990, well after conventional plate tectonics and palaeomagnetics were first established, and its use represents a unique means to accurately constrain and reconstruct past geological plate assemblages independently of conventional palaeomagnetic apparent-polar-wander constraints. Dr Maxlow considers that the advantages and benefits of using modern global geological mapping to constrain plate assemblages for the entire history of the Earth are immeasurable. The application of geological crustal assemblages to the geosciences is further limited only by ongoing innovation and imagination. Furthermore, Expansion Tectonic small Earth reconstructions are uniquely relevant to science and industry by providing models that are accurate enough to know precisely where a particular research project, mineral discovery, climate change indicator, field project, fossil or mineral find was located on the ancient Earth at any moment in time. Completion of bedrock geological mapping and age dating of all continental and seafloor crusts (Geological Map of the World, CGMW & UNESCO, 1990), which is used to measure ancient surface areas and to accurately constrain crustal plate assemblages back in time. Post-year 2000 space-based near Earth data collection and recognition of the significance of large quantities of solar wind related charged electron and proton particles entering the Earth (European Space Agency). This data is used to propose a viable mechanism for increase in Earth mass and radius over time. Unlike the very limited historical evidence available during the mid-twentieth century, Expansion Tectonics is further quantified using an extensive range of modern global data from the fields of geology, geography, geophysics, biogeography, climate, metallogeny, fossil fuels, and space geodetics. Small Earth modelling shows that all diametrically opposed ancient magnetic north and south poles are precisely located, and the established poles and equator are shown to coincide fully with observed climate zonation and plant and animal species development. Plant and animal species evolution is intimately related to continental development, the distribution of ancient continental seas, formation of the modern continents and oceans, and subsequent changes to climate zonation. This knowledge then leads to a completely different understanding of other naturally occurring phenomena such as formation of the Earth, global extinction events, the distribution of continental seas, changing coastlines, sea-levels, climate changes, and the global distribution of natural resources, including metals, coal, petroleum, and natural gas. During the late 1940s and extending into the 1950s, scientists, using sensitive magnetometers adapted from airborne devices developed during World War II to detect submarines, began to recognize strange magnetic patterns across the seafloor. This finding, though unexpected, was not entirely surprising because basalt—the volcanic rock making up the seafloor crust—contains the iron-rich mineral magnetite which can locally distort compass readings. More importantly, because the presence of magnetite gives the basalt measurable magnetic properties, these newly discovered magnetic seafloor patterns provided an important means to study the distribution of intruded volcanic rocks throughout each of the oceans. As more and more of the seafloors were mapped during the 1950s to 1980s, these magnetic patterns turned out to be not random or isolated occurrences but instead revealed a predictable zebra-stripe like pattern. These stripes were found to be symmetrical about centrally located mid-ocean-ridges (Figure 3) within each of the oceans. From this mapping, alternating stripes of magnetised basalt rock were shown to be laid out in parallel rows on either side of the mid-ocean-ridge, where one stripe showed a normal magnetic polarity and the adjoining stripe showed a reversed polarity. While the magnetic stripes were initially not linked to inversions of the Earth’s magnetic field, this connection was later explained by Vine and Mathews in 1963. 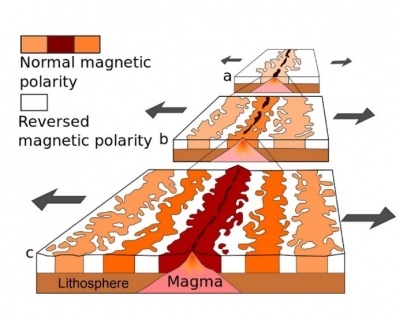 The overall magnetic pattern, as defined by these alternating bands of normally and reversely polarized rock, then became known as magnetic striping. Seafloor spreading was first recognised by Carey in 1958 and again by Heezen in 1960. 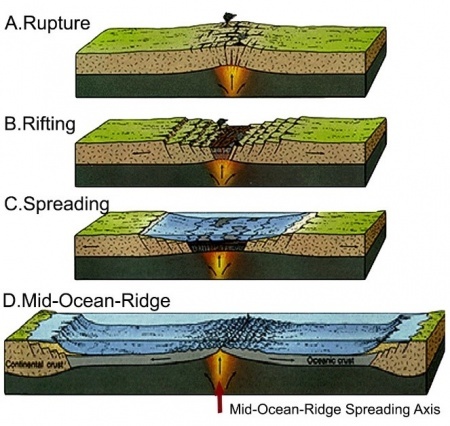 In 1961, scientists—most notably the American geologist Harry Hess—began to theorize that the mid-ocean-ridges mark structurally weak zones, where the seafloor was considered as being ripped apart lengthwise along the crest of the mid-ocean-ridges (Figure 4). From this, it was suggested that new volcanic lava from deep within the Earth must rise through these structurally weak zones to eventually erupt along the crest of the ridges and be quenched by the sea water to form new basaltic seafloor crust. Figure 4 Schematic cross-sections showing structurally weak seafloor crustal zones opening along the crest of a mid-ocean-ridge to form a new ocean. This seafloor spreading hypothesis was based primarily on the magnetic mapping evidence. It was also supported by several additional lines of evidence available at the time including evidence from age dating, seismic activity, and bathymetric surveys. At or near the crest of the mid-ocean-ridges the volcanic seafloor crustal rocks were shown to be very young and these rocks become progressively older when moving away from the ridge crests. The youngest rocks at the ridge crests always have present-day normal magnetic polarity. Moving away from the ridge crests the stripes of rock parallel to the ridges were shown to have alternated in magnetic polarity from normal to reverse to normal and so on. This suggested that the Earth’s magnetic field has reversed many times throughout its history. It was further appreciated from dating the ages of the various seafloor crustal rocks that this process has operated over many millions of years. Subsequent mapping has shown that this process is continuing to form new seafloor crust along the entire 65,000 kilometre-long system of centrally located mid-ocean-ridges, now known to be present throughout all of the oceans. By explaining both the zebra-stripe like magnetic patterns and the construction of the mid-ocean-ridge system the seafloor spreading hypothesis quickly gained converts. Furthermore, this seafloor crustal mapping is now universally appreciated to preserve a natural tape recording of both the history of reversals in the Earth’s magnetic field and a history of opening of each of the oceans. A profound consequence of this observation of seafloor spreading is that new volcanic crust is shown to be continually intruded along the full length of all of the mid-ocean spreading ridges. It is interesting to note that this observation was initially considered to support the theory of Earth Expansion, where new crust was formed at the mid-ocean-ridges as a consequence of an increase in Earth radius. History now shows that subsequent work has favoured plate tectonic theory based on a constant radius Earth, where excess crust generated at the mid-ocean-ridge spreading centres was considered to eventually disappear along seafloor trenches located along the margins of some continents by subduction of the seafloor crustal rocks. Completion of oceanographic work by the Commission for the Geological Map of the World and UNESCO during the 1980s led to publication of the Geological Map of the World map in 1990 (digitised with permission in Figure 5). A legend for each of the colours depicted is shown in Figure 6 which coincide with the main intervals of geological time shown. Figure 5 Geological Map of the World (digitized with permission from the Commission for the Geological Map of the World and UNESCO, 1990). 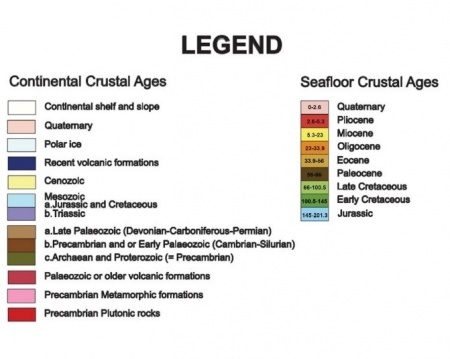 Figure 6 Geological timescale legend showing the various colours of the continental and seafloor crustal ages as shown in Figure 4.5. Seafloor crustal ages are in millions of years before the present-day. Similarly, an Age of Oceanic Lithosphere map was published in collaboration with the National Geophysical Data Centre (NGDC) and the National Oceanic and Atmospheric Administration (NOAA) in 2008 (Figure 7). While this lithospheric map is important, it is rarely used for modelling purposes because of the lack of boundaries between geological epochs and periods. Adams, 2000 uses this map for his graphical modelling. Figure 7 Age of Oceanic Lithosphere map (NOAA & NGDC, 2008). In each of these published maps (Figures 5 and 7), the geophysical seafloor mapping introduced above has been extended to cover all of the oceans. In both maps the magnetic striping evidence has also been taken a step further. By dating the ages of samples of rock collected from the seafloor crust at regular intervals across the bottom of each of the oceans, and by comparing these ages with the magnetic striping, the coloured seafloor crust in these maps is then depicted as intervals of geological time. The coloured seafloor striping shown in Figure 5 represents age data displayed as set intervals of geological time corresponding to the major epochs and periods, while in Figure 7 the age data is displayed as a continuous rainbow coloured time-spectrum. What this means is that the yellow seafloor stripes in Figure 5, for instance, located between the younger red stripes and the older orange stripes, represent basaltic lava that was progressively intruded along the ancient mid-ocean-ridge spreading centres during the Miocene Epoch. The Miocene Epoch is the interval of time extending from 5.33 to 23.03 million years ago. During that time, the younger red Pliocene and pink Pleistocene rocks respectively did not exist. The two adjoining yellow Miocene stripes were then joined together throughout all of the oceans and remained assembled along their common mid-ocean-ridges throughout this interval—progressively widening over time. A good analogy for the seafloor stripes in Figure 5 is growth rings on a tree. For most trees, a new growth ring is added around the outside perimeter of a trunk or branch for each year of growth. By moving back in time and removing each growth ring in turn the diameter of the younger tree can be measured and by counting the remaining rings the age of the tree can be determined. Similarly, the volcanic seafloor stripes in Figure 5 can be visualised as the growth patterns of each crustal plate, where each stripe represents millions to tens of millions of year’s crustal growth. By removing each growth stripe in turn it is then feasible to measure the remaining surface area, and hence radius of the ancient Earth as well as re-assemble the plates along each of the mid-ocean-ridge spreading zones. In contrast to the seafloor crusts, the continental geology in Figure 5 represents bedrock geology. In traditional geological usage the term bedrock refers to the solid rock underlying unconsolidated surface materials, such as soil or alluvium. In stratigraphy, bedrock is also regarded as the native consolidated rock underlying the surface of a terrestrial planet. In Figure 5, these basic definitions are further extended to consider that a bedrock geologic map of the world shows the distribution of differing rock types, that is, rock that would be exposed at the surface if all soil and superficial deposits were removed. None, or very little of this magnetic striping, age dating, or geological evidence was available when both Expanding Earth and plate tectonic theories were first proposed during the 1950s and 1960s. The global distribution of this seafloor magnetic striping, age dating, and geology was, in fact, completed later in order to assist with, and substantiate assemblage of the various crustal plates and continents on a constant radius plate tectonic Earth model. The pattern of colours representing the ages of the crustal rocks confirm that the seafloor rocks are vastly different from the continental crustal rocks. Similarly, the continental rocks, in general, are shown to be more ancient and complex than the seafloor rocks. The intrusion of volcanic lava along each of the mid-ocean-ridge spreading centres represents quenched and cooled mantle rock; not oceanised continental rocks. The coloured striping confirms that all of the oceans contain a mid-ocean-ridge—currently centred beneath the present day pink coloured stripes—and each ocean is increasing its surface area over time. This increase in surface area is symmetrical about the mid-ocean-ridges within each ocean. The maximum age of exposed seafloor volcanic crust, located along the continental margins, is early-Jurassic in age—about 170 million years old—which is shown as areas of pale blue striping. There are no observable instances where the age of the modern seafloor crust is older than 170 million years. If it were possible to move back in time, each of the coloured stripes must be progressively removed in turn. The corresponding edges of each coloured stripe must then be moved closer together. That is, the erupted volcanic rocks within each coloured stripe must be progressively returned to the mantle where they originally came from. When moving back in time, each of the continents must move closer together in strict accordance with the coloured seafloor striping evidence. This geological evidence can then be used to accurately constrain the location of the various crustal plates during modeling of the ancient continents and oceans back in time. It is feasible to also consider that by measuring the surface area of each coloured seafloor stripe in turn, this information can be used to investigate the change in seafloor surface area with time, and from this to investigate a potential change in Earth radius with time. 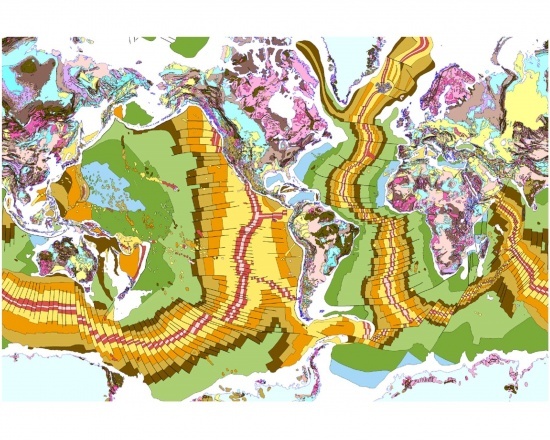 The significance of this Geological Map of the World is that a means to independently test and measure rates of increase in surface areas of all seafloor crusts is now available. From these surface area measurements the ancient Earth radii can also be determined, constrained to each of the coloured seafloor time stripes back to the early-Jurassic Period. From this determination it is then feasible to construct small Earth models constrained to ancient Earth radius, and to assemble each of the identified plates back in time to the early-Jurassic. This small Earth modelling study can then be used to test the suggestion that plate tectonics is better suited to an increasing Earth radius tectonic model. Geological mapping of the Earth shows there are basically two types of crusts covering the Earth’s surface (Figure 5); relatively thick continental crusts and relatively thin seafloor crusts. Each of these crusts have different physical characteristics and each has completely different age characteristics—continental crusts are predominantly older and seafloor crusts are predominantly younger. Modern geological mapping also shows that new seafloor crust is being added continuously along the entire length of the mid-ocean-ridge spreading centres and in doing so progressively increases the surface areas of each of the oceans over time. The Earth’s overall seafloor and continental crustal budget increases with time and all increases in surface area are cumulative with time. Once formed, the surface areas of seafloor and continental crust are fully fixed in the geological rock-record. Seafloor and continental crusts are not removed by conventional subduction processes. There are no pre-existing seafloor or continental crusts to account for. Measuring seafloor crustal surface areas shows that both surface area and Earth radius increase exponentially over time. Sediments deposited within continental sedimentary basins, as well as magmatic intrusions and volcanic eruptions, represent new rocks or crusts that accumulate primarily within areas of extensional continental settings. Continental basin sediments, magmatic intrusions, and volcanic eruptions are not removed from the Earth’s surface by subduction processes and, in conjunction with additional on-going geologic processes, are essentially preserved in the rock-record. Moving back in time, all younger sediments and intruded igneous rocks must be returned to their respective pre-deposition or pre-intrusive places of origin. Moving back in time, the surface area of sedimentary basins and igneous complexes must be progressively reduced to their pre-rift, pre-extension, or pre-breakup configurations. What these assumptions mean for Expansion Tectonic small Earth models is that, by moving back in time, all sediments are returned to the ancient lands where they were initially eroded from and all magmatic and volcanic rocks are returned to the mantle or lower crustal regions where they originally came from. The surface areas of each of the sedimentary basins or rift zones are then reduced to simulate the return of the crust to a pre-extension or pre-rifted state—deconstructed geology. Similarly, intruded seafloor crustal rocks, plus a percentage of new seawater and atmospheric gases, are also progressively returned to the mantle and plate margins. Remaining crusts are then re-assembled along their respective mid-ocean-ridge spreading centres in strict accordance with the geology shown on the Geological Map of the World. As Shields noted in 1997, “Ultimately world reconstructions must be congruent not only with the data from geology and geophysics, but also with palaeobiogeography, palaeoclimatology, and palaeogeography.” What this means is that tectonics cannot solely rely on just geology and geophysics to quantify a theory. Theory must include all modern data from all fields of the Earth sciences. Expansion Tectonic modelling is based on the best explanation of existing empirical geoscientific data. It is not a theory seeking physical support. It is rather a concept proposed which is shown to best fit all existing physical data in a much superior manner than does the plate tectonic approach. The modern data used to quantify Expansion Tectonics is identical to that used in conventional plate tectonic studies, only the interpretation of the data is different. As such, Expansion Tectonics can just as equally be referred to as “plate tectonics modelled on an increasing radius Earth”. The outcomes of geology-based small Earth crustal modeling are more than adequate to quantify the validity of an increasing Earth radius crustal process. To further quantify the merits of small Earth modeling studies modern geological, geophysical, geographical, and biogeographical evidence are introduced in order to test the viability and distribution of this data on small Earth models. physical facts. The presence of gigantic plants and animals in ancient history can be explained by a smaller earth. Dinosaur size grew to extremes but with time, the largest land animals have diminished in size over the millions of years. Mechanical engineer Stephen Hurrell has plotted the largest land animals since the age of the dinosaurs and there is a definite reduction in size that could be explained by a smaller, less massive earth. Applying ancient magnetic evidence preserved in rocks to Expansion Tectonic small Earth modelling shows that when the mathematically imposed constant surface area and constant Earth radius premises are removed from conventional palaeomagnetic observations, these same observations demonstrate that the ancient magnetic pole data (McElhinny & Lock, 1996) is consistent with an increasing radius Earth. The application of palaeomagnetic pole data to small Earth models shows that all ancient magnetic poles cluster as unique diametrically opposed north and south poles (Figures 12 & 13). Figure 12 Small Earth Archaean to Future magnetic North Poles (red dots). During the Precambrian and Palaeozoic the North Pole was located within eastern Mongolia, prior to continental breakup and dispersal during the Mesozoic to present-day times. (Data after McElhinny & Lock, 1996). Figure 13 Small Earth Archaean to Future magnetic South Poles (blue dots). During the Precambrian and Palaeozoic the South Pole was located within west central Africa, prior to continental breakup and dispersal during the Mesozoic to Recent. Similarly, plotted ancient latitude data (Pisarevsky, 2004) coincide with and quantify predicted climate zones on each small Earth model constructed (Figure 14). Additional geographical and biogeographical information further quantify the location of these ancient magnetic poles, equators, and climate zones as determined from unconstrained palaeomagnetic pole and latitudinal data. Figure 14 Archaean to present-day palaeolatitude sample site data centred on zero degrees east longitude. Red dots represent calculated data located in the equatorial climate zones, green dots represent data located in the north and south temperate zones, and blue dots represent data located in the north and south Polar Regions. Heavy dashed yellow lines represent climate zone boundaries and fine dashed yellow lines represent an arbitrary plus and minus 5 degrees data error. Note: no data are shown for the late-Devonian model. (Data after Pisarevsky, 2004). When published coastal geography (Scotese, 1994, and Smith et al., 1994) is plotted on each of the Expansion Tectonic small Earth models large, conventional, Panthalassa, Iapetus, and Tethys Oceans are not required on a smaller radius Earth. Instead, this same coastal geography defines the presence of a more restricted network of continental Panthalassa, Iapetus, and Tethys Seas, which represent precursors to the modern Pacific and Atlantic Oceans and emergent Eurasian continents respectively (Figure 15). Figure 15 Shoreline palaeogeography on Archaean to present-day small Earth models (data after Scotese, 1994, and Smith et al., 1994). 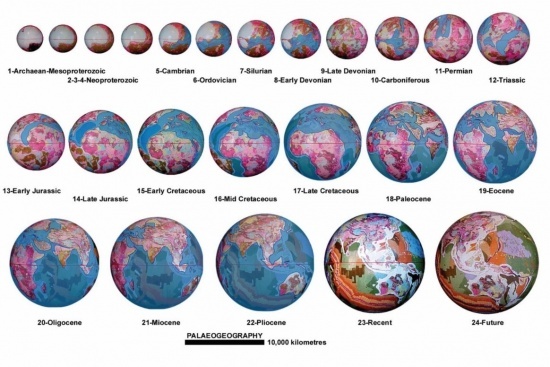 Each image advances 15 degrees longitude throughout the sequence to show a broad coverage of palaeogeographic development. Note: there are no published data available for the late-Devonian model or models prior to the Cambrian Period. The early Panthalassa and Iapetus Seas formed during the Early Permian to Early Jurassic periods (260 to 165 million years ago) and initiated as shallow sedimentary basins within the present North West Pacific and North Atlantic Ocean regions respectively. These progressively opened and extended throughout the Mesozoic and Cenozoic Eras as the modern Pacific and Atlantic Oceans. In contrast, the Tethys Sea had its origins during the Early Precambrian Era as a continental sea located within what is now Europe and Asia. This sea progressively enlarged and extended in area during the Precambrian, Paleozoic and Mesozoic Eras during crustal extension and subsequent opening of the modern oceans. From this coastal geography the emergent land surfaces on each small Earth model define the position and outline of the ancient Rodinia, Gondwana, and Pangaea supercontinents and sub-continents (Figure 16). The coastal geography demonstrates an evolutionary progression and development of each of the ancient seas and supercontinents throughout Earth history which is intimately related to changes in sea-level, changes to the outlines of continental sedimentary basins, changes incurred during crustal mobility, and changes to sea-levels once the modern oceans opened during the late-Permian breakup of Pangaea. Figure 16 The Tethys Sea and Laurentia, Baltica, Laurussia, Laurasia, and Gondwana supercontinental configurations centred over the ancient North Pole, extending from the Cambrian to Triassic Periods (data after Scotese, 1994, and Smith et al., 1994). The Pangaea, Gondwana and Rodinia supercontinents and smaller sub-continents on an Expansion Tectonic Earth demonstrate that, instead of being the result of random dispersion-amalgamation or collisional events, each supercontinent is progressive, and represents an evolutionary crustal-forming process. The distinguishing feature of supercontinents on each Expansion Tectonic model is the inter-relationship of continental sedimentary basins, the network of continental seas and network of crustal movements. Variation of each of these inter-relationships in time results in changes to the distribution of exposed continental land and seas. Supercontinent configuration is then defined by a progressive extension of continental sedimentary basins, by ongoing crustal movements, and changes in sea-levels as the modern oceans opened and rapidly increased in area to the present-day. Changes in sea-level on an Expansion Tectonic Earth occurs in response to climatic change, as well as a shift in the distribution of continental seas, to crustal movements, mountain building, erosion, opening of the post-Permian modern oceans and production of new water at the mid-ocean-ridges. These changes all modified the ancient coastal outlines and resulted in a change in the exposed continental land areas. This is further confirmed by the distribution of climate-dependant sedimentary rocks such as limestone reefs, and the distribution of climate-dependant marine and terrestrial fossil species. Figure 19 Distribution of early-Palaeozoic trilobite species plotted on an Ordovician small Earth model. Trilobite data are shown as red dots (data after PaleoBioDB, 2015) in relation to ancient climate zones, an early-Palaeozoic South Polar ice-sheet, shaded white, and the distribution of ancient continental seas. On an Expansion Tectonic Earth the timing and development of ancient continental seas and supercontinents, along with formation of the modern continents and oceans, represents the prime cause for evolution of all life forms on Earth. The network of ancient continental seas, in particular, provided an ideal setting for the primitive Precambrian microbe’s effectiveness as nurseries of evolution and to markedly drive subsequent evolutionary change in all life forms. 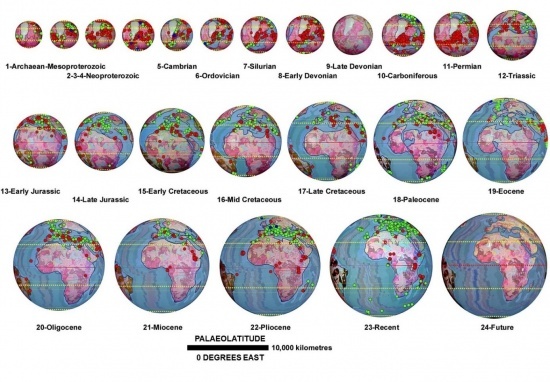 On small Earth models the locations of fossilized fauna and flora (PaleoBioDB, 2015) are used to illustrate their distribution in relation to the ancient lands and seas, and to confirm the established climatic zones as well as the poles and equator. The distribution of various marine fauna, such as the Cambrian and Ordovician trilobites (Figure 19), demonstrates the ease and simplification of migration routes and their development during the Palaeozoic Era. Barriers to the migration of trilobites, as well as other related species are then simply limited to deep marine restrictions and, to a limited extent, on latitude and climate extremes. On each of the Expansion Tectonic small Earth models, warm sea waters existing during much of the Palaeozoic extended from equatorial regions through to the North Polar Region (Figure 16) allowing newly evolved species to readily colonise and populate throughout each of the interconnected ancient Tethys, Iapetus, and Panthalassa seaways. This distribution of warm seas also limited the presence of a polar ice cap in the North Polar Region and instead limited presence of ice to the exposed Gondwanan South Polar Region (Figure 18). During continental break-up and opening of the modern oceans, the distributions of species and migration routes were then disrupted, forcing species endemic to the various regions to interact, extend their boundaries, fragment or simply become extinct with time. The timing of ocean development in many of these areas was also reflected in the changes in sea-level, facilitating marine faunal migration by extending and expanding immigration routes and moderating climatic differences. Figure 20 Permian and Triassic small Earth crustal assemblages showing the ancient coastline distribution as well as remnants of the ancient Pangaea supercontinent (coastlines after Scotese, 1994, and Smith et al., 1994) during the end-Permian extinction event. The figure also shows the locations of Permian continental rupture commencing in the north and south Pacific and Arctic Ocean regions to form the modern oceans. During early-Palaeozoic to present-day times there have been a number of drastic and prolonged changes to sea-levels which coincide precisely with known extinction events. On the small Earth models major changes in sea-levels occur as a result of separation or merging of previous ancient continental seas, as well as onset of geosynclinal activity and orogenesis, breakup of the ancient supercontinents, opening of the modern oceans, and post-Permian draining of the ancient continental seas. Depending on the severity of these events, sea-level changes may have also adversely affected regional to global-scale climate, as well as ocean-water circulation patterns, species habitats, and the type and location of sedimentary deposition (e.g. end-Permian extinction event, Figure 20). 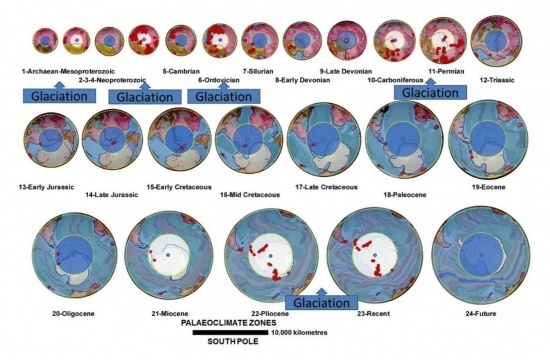 The ancient climate on an Expansion Tectonic Earth can be investigated by plotting the distribution of selected climate-dependant rocks and comparing the distribution patterns with the location of established ancient poles, equator, and climate zones. Correlation of coal swamps, thick sandstone sequences and glacial rocks are excellent indicators of wet climates, while dry climates are indicated by evaporates, such as salt deposits, and equatorial regions by carbonate reefs. The distribution of published occurrences of mid- to late-Palaeozoic carbonate reef deposits—around 300 to 250 million years ago—is shown on the Permian small Earth model in Figure 17 (data from Flügel, 1994), along with the location of established tropical climate zones and circles of latitude. Also shown is the distribution of ancient continental seas, previously established from the distribution of published coastal outlines on the small Earth models. This distribution of carbonate reefs is based on published records and does not necessarily represent the entire global distribution of reefs in lesser studied regions. Figure 17 Distribution of Palaeozoic carbonate reefs (yellow dots) as well as ancient Permian coastlines and continental seas, plotted on a Permian small Earth model (reef data from Flügel, 1994). In this figure there is some minor disparity between the plotted reef locations and the published ancient shorelines. This is only apparent because the reef data extend back in time a further 100 to 200 million years to times when these coastlines were different to those shown on this Permian Pangaean small Earth model. In this figure, the distribution of carbonate reefs is, in general, shown to neatly straddle the equator and shows a good correlation with the adopted equatorial Tropic zones. Outlying reefs shown within the northern Temperate Zone reflect the presence of warm tropical Tethys Sea currents extending into these regions. There have been at least five major ice ages in the Earth's geological past, referred to as the Huronian, Cryogenian, Andean-Saharan, and Karoo ice ages, and the current Quaternary glaciation. Outside these ages, the Earth was ice-free even in high latitudes. Evidence for ancient ice-sheets and glacial occurrences in the rock-record comes from various sources. These include the presence of striated rock surfaces and rock formations created by the passing of a glacier, large foreign rocks embedded within sedimentary strata, and the accumulation of characteristic rock debris. This rock debris accumulates where a glacier or ice-sheet melts and includes deposits that occur adjacent to streams flowing from a melting glacier, through to debris rafted well out to sea by icebergs where melting later deposits the debris on the seafloor. The locations of ancient North and South Poles were previously established from small Earth modelling of available palaeomagnetic pole data. Figure 18 shows locations of the South Polar Region, centred over the ancient South Pole. Also shown is the published distribution of known glacial rocks and formations—shown as red dots, after Hambry and Harland, 1981, as well as the presence of known ice-sheets shaded in white. Both the glacial rocks and ice-sheets coincide with locations of the highlighted five major glacial events. The distribution of ancient continental seas and modern oceans are shown as pale blue and polar climate zones are shown as dark blue circles. Figure 18 Locations of ancient South Polar Region shaded in blue on small Earth models. Known glacial data are shown as red dots, after Hambry and Harland, 1981, glacial events are highlighted, the presence of known ice-sheets are shaded white, and ancient seas and modern oceans are shaded pale blue. 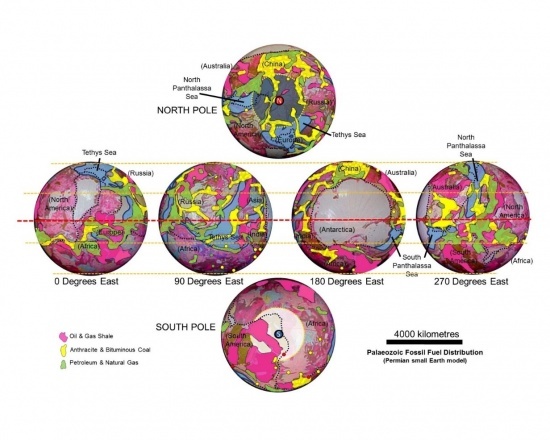 The distribution of all latitude dependent rocks on Expansion Tectonic Earth models is shown to coincide precisely with the ancient poles, equator, and climate zones established from magnetic pole data. In each case a distinct latitudinal zonation paralleling the palaeoequator is evident, and a distinct northward shift in climatic zonation suggests that an inclined Earth rotational axis, inclined to the pole of the ecliptic, was well established during the Palaeozoic persisting to the Recent. Figure 21 Distribution of orogenic copper, silver, molybdenum, and gold plotted on the Permian small Earth model. Data are shown as red dots (data after USGS Mineral Resource Data Set, 2015) in relation to continental crustal assemblages highlighted as dashed white lines. Cross-cutting orogenic plate boundary metal deposits located along the west coasts of the Americas are shaded yellow. Metal distributions and mineralisation settings on Expansion Tectonic small Earth models show that the data and settings are essentially the same as those identified within conventional studies. The difference being that, on an increasing radius Earth, prior to the early-Triassic Period, all continental crusts were assembled together on a smaller radius supercontinental Earth. The small Earth assemblages then enable pre-Triassic metallogenic provinces from otherwise remote locations to be assembled together as unique, inter-related provinces on a smaller radius Earth. The assemblage of continents and crustal elements on small Earth models then provides a means to investigate the spatial and temporal distribution of metals across adjoining continents and crustal regimes. Recognition and understanding of past metal distributions on the present-day Earth then potentially enables mineral search and genetic relationships to be extended beyond their known type localities (e.g. Figure 21). Figure 22 Compilation of oil and gas shale (magenta), coal (yellow), and petroleum and natural gas (green) distributions shown on the Permian increasing radius small Earth model (data after U.S. EIA report, 2013; Major Coal Deposits of the World map, 2010; World Oil and Gas Map (4th edition), 2013). Fossil fuel distributions on Expansion Tectonic small Earth models highlight the global interrelationships of resources coinciding with the distribution of a network of Palaeozoic continental seas and low-lying terrestrial environments. The transition from deposition of oil and gas shale to coal to petroleum and natural gas is found to be consistent with the various periods of maximum and minimum sea level changes occurring during periods of marine transgression and regression, in particular after regression of the continental seas during the Palaeozoic time periods leading to crustal breakup and opening of the modern oceans during the late-Permian (Figure 22). In the Expansion Tectonic small Earth modelling studies of Maxlow 1995, 2001, heavy reliance is placed on the published Geological Map of the World map (CGMW & UNESCO, 1990) (Figure 8, reproduced in 24-gore sinusoidal projection) to constrain assemblage of both the oceanic and continental plates back in time. In order to constrain plate assemblages, all mathematical-based preconceptions about constant surface areas are simply ignored in order to both measure the ancient surface area of the Earth and establish a formula to determine an ancient Earth radius at any moment in time. This geological mapping and measured surface area data are then used to accurately constrain plate assemblages on small Earth geological models of the ancient Earth extending from the early-Archaean, some 4,000 million years ago, to the present-day plus one model extended to 5 million years into the future. Figure 8 Geological Map of the World (after CMGW & UNESCO, 1990) showing time-based bedrock geology reproduced in 24-gore sinusoidal projection. With completion of the Geological Map of the World it is a relatively simple process to determine post-Triassic ancient Earth radii (younger than 200 million years ago) by measuring surface areas of each of the coloured seafloor crustal stripes (Figure 8). The added advantage of this geological map is that the seafloor crusts also have known ages, which are in turn used to accurately constrain the moment in time when these rocks were first formed. Once the areas of the coloured stripes are known, the cumulative areas of seafloor crust are then taken away from the present-day Earth surface area to mathematically derive ancient Earth radii. Measuring surface areas of seafloor basaltic lava intruded along the mid-ocean-ridges to determine a rate of increase in ancient Earth radius over time was pioneered by Jan Koziar during the early 1980s. Koziar did not constrain the surface area data to a constant radius Earth model, as predecessors had done, but set out to determine ancient Earth radii in order to quantify an increasing Earth radius model. A present-day rate of 25.9 millimetres per year increase in Earth radius was measured by Koziar (1980), and similarly 19.9 millimetres per year increase was also measured by Blinov (1983). By removing the constant radius and surface area premises from similar measurements made by Garfunkel (1975), Steiner (1977), and Parsons (1982), a rate of increase in Earth radius can also be calculated from their data as 20, 20, and 23 millimetres per year respectively, giving a mean rate of all 5 calculations of 22 millimetres increase in radius per year—which is consistent with the present-day exponential rate of 22 millimetres per year measured by Maxlow (1995). The method used to determine pre-Jurassic Earth radii (older than 200 million years ago) as well as a primordial Earth radius (early Archaean—4,000 million years ago) is less well constrained because of the complex nature of continental crusts. The method adopted by Maxlow 2001 during pre-Jurassic small Earth model construction was, by moving back in time the radius of each preceding model is progressively reduced in small, incremental stages. An equivalent area of the youngest sedimentary and magmatic rocks remaining were then removed from the primary sinusoidal base map. The established global network of sedimentary basins was then progressively reduced in surface area until only the most ancient Precambrian continental cratonic and orogenic rocks remained. This method is justifiable because younger crustal rocks represent sedimentary and magmatic rocks that were deposited, intruded, or extruded after the older cratonic or orogenic crustal rocks were first formed. During progressive removal of the younger rocks, each of the sedimentary basins and rift zones were then restored to a pre-stretching or pre-rift configuration and all sediments and magmatic rocks were simply returned to the exposed ancient land surfaces or mantle where they originated from. By using this rather subjective construction method an Archaean small Earth model with a primordial Earth radius of about 1,700 kilometres can be constructed. This primordial small Earth is made up of an assemblage of the most ancient pink and red coloured Archaean cratonic fragments, plus remnant khaki coloured early-Proterozoic orogenic rocks (Figure 8). The 1,700 kilometre early-Archaean Earth radius represents an approximate limiting radius for the most ancient primordial Earth. This primordial radius can then be used to establish a mathematical formula to calculate Earth radius at any moment back or forward in geological time. From this primordial small Earth radius, mathematical modeling studies of Archaean to Triassic continental crusts, plus previously modelled early-Jurassic to present-day Earth seafloor crusts show that the change in Earth radius increases in accordance with an exponential rate of increase in Earth surface area (Figure 9). Figure 9 Exponential increases in Earth radius extending from the Archaean to present-day. Graph shows post-Triassic increase in radius derived from seafloor mapping and pre-Jurassic change in radius derived from an Archaean primordial Earth radius of 1,700 km. 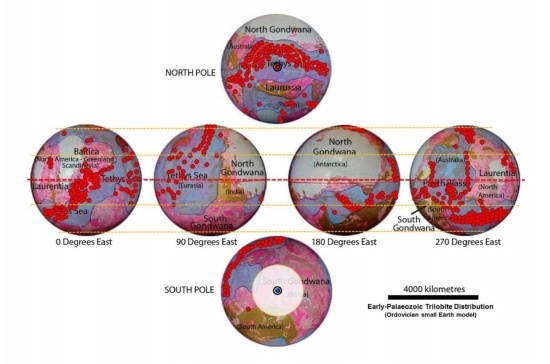 Small Earth models constructed are shown as red coloured circles and squares. An inferred core-mantle boundary remains speculative. Where: Ra = the ancient Earth radius at time t, R0 = the present-day mean Earth radius, Rp = the primordial Earth radius = 1,700 kilometres, e = base of natural logarithm, k = a constant = 4.5366 x 10-9/year. In Figure 9 the location of constructed Archaean to present-day small Earth models used to constrain this graph are shown as red dots and squares, along with historical estimates of ancient Earth radius by others based on both geophysical methods and visual reconstructions of the continents. The radius curves of Koziar and Vogel coincide precisely with the estimates of ancient Earth radius established to about 200 million years ago. Establishing these historical curves was limited to early versions of seafloor mapping data available at the time and the authors used estimates of pre-Jurassic continental crustal areas only, without considering the potential for continental crustal extension. 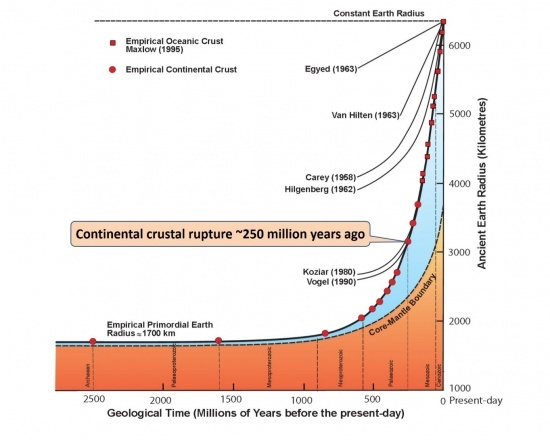 This graph suggests that during the early-Archaean to mid-Proterozoic times—ranging from about 4,000 to 1,600 million years ago—the Earth’s ancient radius remained relatively static, increasing in radius by approximately 60 kilometres during the entire 2,400 million years of ancient Earth history. From the mid-Proterozoic—about 1,600 million years ago—the Earth then underwent a steady to accelerating increase in radius to the present-day. This accelerating increase is reflected by breakup of the Pangaean supercontinental crust during the late-Permian (250 million years ago), the subsequent opening of the modern oceans, and the relatively recent development of modern seafloor crusts. The graph also suggests that, during Precambrian times, an increase in both radius and surface area of the Earth was accommodated for by molecular-scale redistribution and extension of the ancient crusts—microns per year increase in radius. This is evidenced in the geological rock-record by linear rock fabrics often seen in the most ancient rocks exposed at surface today—such as schist, gneiss and foliated granitoid rocks. The ability for continental crust to absorb this molecular-scale crustal extension then began to rapidly decline during the Palaeozoic Era, resulting in an overall weakening and subsequent thinning of the crusts within sedimentary basins, until the ability to extend was finally exceeded during late-Permian to Triassic times. During these latter times the continental crust began to fail, rupture, and break apart to ultimately form the modern continents and open to form the modern oceans. By removing the inherent strength of the overlying continental crust, the Earth then underwent a rapid to accelerating increase in Earth radius and surface area to the present-day rate of increase of 22 millimetres per year, and by inference this process will continue well into the future. The seafloor mapping shown on the Geological Map of the World (Figure 8)—reproduced in 24-gore sinusoidal projection in order to cut and paste directly onto globes—was initially used to constrain the location and assemblage of all post-Triassic seafloor crustal plates on smaller radius Earth models (Maxlow 1995) (Figure 10). Moving back in time, this assemblage involved progressively removing each coloured seafloor stripe in turn and refitting all remaining plates back together along their respective mid-ocean-ridge spreading zones on pre-determined smaller radius globes. 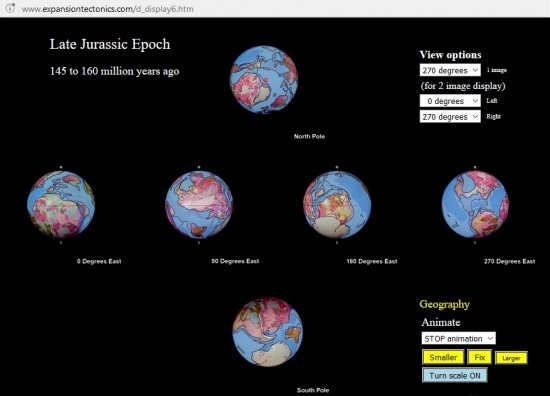 Figure 10 Spherical small Earth models of a Jurassic to present-day increasing radius Earth. Each small Earth model demonstrates that the seafloor crustal plate assemblage coincides fully with seafloor spreading and geological data and accords with derived ancient Earth radii (Maxlow 1995). Modelling the seafloor crustal plates on small Earth models consistently show that all plates assemble back in time with a single unique fit, where each plate assembles together with a high degree of precision along their respective mid-ocean-ridge spreading zones. This single unique geologically-constrained plate-fit contrasts strongly with the multitude of poorly constrained plate-fit options and ill-defined schematic supercontinental assemblages proposed by conventional palaeomagnetic studies (e.g. Scotese, 2000; Zhao et al., 2004; Li et al., 2008; Meert, 2014). The uniqueness of small Earth assemblages also contrasts strongly with the conventional plate tectonic requirement to arbitrarily fragment continents in order to comply with the seafloor mapping data. It also contrasts with the requirement to dispose of large areas of inferred pre-existing crust beneath subduction zones in order to maintain the mathematical-based constant surface area premise. What is seen from the seafloor Expansion Tectonic small Earth modelling studies is that all remaining continental crusts unite precisely to form a single global Pangaean supercontinental crust covering the entire ancient Earth during the late-Permian Period, at around 50 percent of the present Earth radius. At that time the bulk of the seafloor volcanic crust, along with much of the atmosphere and hydrosphere, were retained within the mantle from where they initially came from. From this Pangaean supercontinental assemblage continental sedimentary basins were then shown to merge to form a global network coinciding with relatively shallow continental seas and the ancient supercontinents and seas were, in turn, defined by the variation in coastal outlines and sea-levels. Testing the application and viability of Expansion Tectonic small Earth models back to the early-Archaean requires an extension of the fundamental cumulative seafloor crustal premise to include continental crusts. Continental crust is reconstructed on pre-Triassic small Earth models—older than 250 million years ago—by considering the global distribution of the primary geological crustal elements cratons, orogens, and basins. In order to construct small Earth models, further consideration is also given to an increase in Earth surface area occurring as a result of crustal stretching and extension within an established network of continental sedimentary basins (Maxlow, 2014). Moving back in time, this crustal extension is progressively restored to a pre-extension, pre-stretching, or pre-rift configuration by simply removing young sedimentary and intruded magmatic rocks and reducing the surface areas of each of the sedimentary basins in turn, consistent with the empirical geology shown on the Geological Map of the World map (Figures 5 & 8). During this process, the spacial integrity of all existing ancient cratons and orogens is retained until restoration to a pre-orogenic configuration is required. By removing all basin sediments and magmatic rocks, as well as progressively reducing the surface areas of the sedimentary basins in turn, a series of small Earth models can then be readily assembled back to the early-Archaean (Maxlow, 2001). During the early-Archaean the primordial Earth then comprised an assemblage of the most ancient Archaean cratons and basement rocks existing on Earth today—all other rocks, minerals, and elements were simply returned to their places of origin (Figure 11). Figure 11 Spherical Archaean to future small Earth geological models. Models show relative increase in Earth radii over time showing both continental and seafloor geology. Models range in age from the early-Archaean to present-day, plus one model projected 5 million years into the future (Maxlow, 2001). Expansion Tectonic small Earth modeling studies demonstrate conclusively that assemblage of the crustal plates coincide fully with all seafloor spreading and geological data and accord precisely with the derived ancient Earth radii for each model constructed. This coincidence applies not only to the more traditional oceans, such as the Atlantic Ocean where conventional reconstructions agree in principle, but also to the Pacific Ocean where the necessity for subduction of all or part of the seafloor crusts generated at spreading ridges is refuted. These small Earth modelling studies demonstrate that the mechanism of seafloor spreading and distribution of crustal plates, as highlighted by the seafloor geological mapping, provides a definitive means to accurately constrain crustal assemblages on small Earth models with only one plate-fit option. 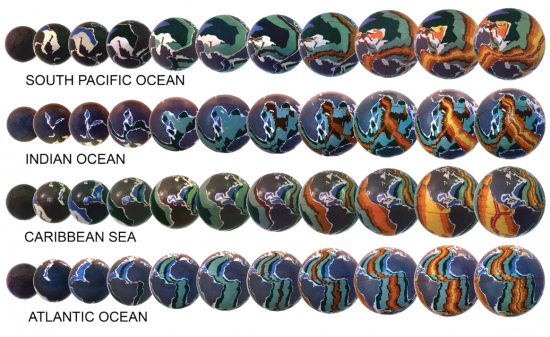 Crustal assemblages on each of the small Earth models also show that large Panthalassa, Tethys, and Iapetus Oceans are not required during model construction. These oceans are instead replaced by lesser continental Panthalassa, Iapetus, and Tethys Seas, which represent precursors to the modern Pacific and Atlantic Oceans as well as ancient sedimentary basins located on many of the present-day continents. Similarly, emergent land surfaces during the Precambrian and Palaeozoic Eras are shown to equate to the conventional Rodinia, Gondwana, and Pangaea supercontinents and smaller sub-continents. On each small Earth model, supercontinental development is shown to be progressive and evolutionary which is related to progressive crustal extension within an established network of continental sedimentary basins, changes to Earth surface curvature, and changes to sea levels. From the outcomes of this empirical small Earth modeling exercise it is concluded that crustal modeling studies more than adequately quantify the validity of an increasing Earth radius tectonic process. The unique assemblage of all continental and seafloor crustal fragments on small Earth models demonstrates that an increasing radius Earth, extending back 4,000 million years to the beginning of Earth’s geological past, is indeed viable. What the full range of Archaean to present-day small Earth models also demonstrate is that, rather than being a random, arbitrary, amalgamation-dispersal-amalgamation cyclical crustal forming process as we are currently led to believe, crustal development on an increasing radius Earth model is instead shown to be simple, evolving, and predictable. During the 19th and 20th centuries there were a number of independent thinkers who considered opening of the oceans could be attributed to an increase in Earth radius. In 1859, Alfred W. Drayson published his book “The Earth We Inhabit: Its past, present, and probable future” in which he speculated that the Earth had undergone an “expansion” over time. In 1888, Yarkovski was the first to postulate a growth of the Earth mass. Similarly, Roberto Mantovani in 1889, and again in 1909, published a theory of “...earth expansion and continental drift.” In this theory Mantovani considered that a closed continent covered the entire surface on a smaller radius Earth. He suggested that “...thermal expansion led to volcanic activity, which broke the land mass into smaller continents.” These continents then drifted away from each other because of further “expansion” at the “rip-zones” where the oceans currently lie. The concept of an Expanding Earth was further advanced by Halm (1935), Keindl (1940), Egyed (1956), Carey (1958), and Heezen (1959, 1960), developed primarily in the German and Russian literature. This also included the pioneering work and publications of Lindemann in 1927, small Earth modelling by Ott Christoph Hilgenberg during the 1930s, S. Warren Carey during the 1950s to late 1990s, Jan Koziar during the 1980s, small Earth modelling by Klaus Vogel during the 1980s and 1990s, and formal research into Expansion Tectonics by Dr James Maxlow during the 1990s and 2000s. In 1915, Alfred Wegener, a German polar researcher, physicist, and meteorologist, was making serious arguments for the idea of Continental Drift in the first edition of his book, “Die entstehung der kontinente und ozeane” [The Origin of Continents and Oceans]. In his book, as did mapmakers before him, he noted how the shape of the east coast of South America and the west coast of Africa looked as if they were once joined. When Wegener initially presented his arguments for the idea of Continental Drift he became the first to gather significant fossil and geological evidence to support his simple observation for the breakup and subsequent movement of the continents through time. From these beginnings, Wegener went further to suggest that the present continents once formed a single land mass—later called Pangaea. This land mass was inferred by Wegener to have subsequently broken up and drifted apart, “...thus releasing the continents from the Earth’s mantle.” Wegener likened this too "...icebergs of low density granite floating on a sea of denser basalt". At that time Wegener’s ideas were not taken seriously by most geologists or scientists alike. They rightly pointed out that there was no apparent mechanism for Continental Drift. Without detailed evidence, or a force sufficient to drive the movement, the theory was subsequently rejected for over 50 years: ...the Earth might have a solid crust and mantle and a liquid core, but there seemed to be no way that portions of the crust could move around the surface of the Earth. Unfortunately, Wegener could not explain the force that drove Continental Drift and vindication for his efforts did not come until well after his untimely death. Other responses were less than sympathetic, including: “Utter damned rot” (the then President of the American Philosophical Society). “If we are to believe this hypothesis we must forget everything we learned in the last seventy years and start all over again” (Thomas Chamberlin). “Anyone who valued his reputation or scientific sanity would never dare support such a theory” (a British geologist). Although Continental Drift was initially rejected for many years, when Wegener introduced his theory he did, in fact, set in motion a completely new train of thinking and speculation about the origin of our continents and oceans. As Wegener correctly promoted, the fit of the Americas against Africa and Europe was real and had to be explained. Time has, of course, since shown that it was only the mechanism behind Continental Drift that was difficult to explain, not the actual fit of the continents. Since then, with changing ideas about the Earth, and also a name change, Wegener’s theory of Continental Drift is now credited with having given rise to the modern theory of Plate Tectonics. Most people have come to accept plate tectonic theory without question and without prior concern for the considerable amount of initial and still relevant rejection of Continental Drift. “But in the end the rigorous approach has paid off. For it has revealed a discrepancy which had not been apparent. It was not my method that was at fault, but my assumption that the earth of Pangaea was the same size as the earth of today.” From this research Carey conclude that…“The assembly of Pangaea is not possible on the earth of the present radius, but on a smaller globe…these difficulties vanish.” Regardless of subsequent progress made in plate tectonics since Carey’s initial Continental Drift modelling studies, this conundrum still remains unrecognized and unresolved. The assemblage of Pangaea is still not possible on an Earth of the present-day radius without having to resort to using sketches of crustal fragments in order to adhere to a constant Earth radius insistence. Small Earth models of the Earth are fundamental to understanding what Expansion Tectonics has to offer to tectonics. The main researchers into small Earth plate modelling primarily include: Hilgenberg, Vogel, and Maxlow, with lesser researchers including: Brösske (1962), Barnett (1962, 1969), Creer (1965), Dearnley (1965), Shields (1979, 1983), Owen (1976, 1983), Schmidt and Embleton (1981), Neiman (1984, 1990), Perry (in Carey, 1986), Scalera (1988), Adams, (2000), and Luckert, (2004). Although there is extensive literature on the subject of Earth expansion, the published models represent essentially the sum-total from which Earth Expansion theory has been judged in the past. The historical models in particular were developed, and the majority conceived, prior to or during the early stages of investigation into sea-floor spreading, and prior to a complete and accurate geological and geochronological coverage of the ocean basins. The reconstruction of continents on historical unconstrained small Earth models all suffered from a lack of precise cartographic methods and quantitative constraint on both ancient Earth radius and time. Despite the crude reconstruction method used by Barnett he noted that, "it is difficult to believe that chance alone can explain this fitting together of the continental margins". This, in effect, has been the driving force behind advocates of Earth Expansion, the fact that all of the continents can be convincingly reconstructed onto smaller globes. Creer also noted that, "the fit of the continents on a smaller Earth appeared to be too good to be due to coincidence and required explaining". Shields concluded that "the Tethys Sea was much narrower than many suppose". Schmidt and Embleton, in commenting on the Early Proterozoic common apparent polar-wander paths for Africa, Australia, Greenland and North America demonstrated that the Proterozoic geological, geochronological and palaeomagnetic information can be satisfactorily resolved on a smaller Earth diameter. Neiman considered the process of stretching and rupture of the core to be characteristic of the growth of continental zones. Perry was able to generate successive positions of spreading ridge, fracture zones, and magnetic anomaly lineation’s, and from these he was able to calculate the amount of radial expansion implied by each anomaly. Scalera used computerized cartographic methodology in an attempt to resolve the most fundamental problem confronting Earth expansion; that of spherical geometry varying with time. From the results of his research Scalera formed the opinion that "the Earth's history, as written and clearly readable on the bottom of the oceans, is not the history of plate tectonics but the history of a planet that has expanded". Stimulated by the pioneering work of Wegener on Continental Drift, Hilgenberg has been attributed as being the first model maker to fit all of the present-day land masses together to completely enclose a series of small papier-mâché globes and in 1933 his work was published in his classical book “Vom Wachsenden Erdball” [About the growing Earth]. On each of his globes (Figure 1) all oceans were progressively eliminated and the remaining continental crusts eventually enclosed the entire Earth on a globe at about 60 percent of the diameter of the present Earth. 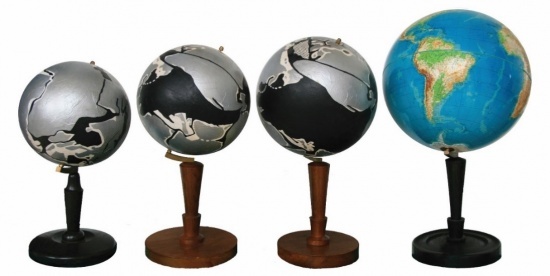 Figure 1 Reproductions of Hilgenberg’s (1933) small Earth models, attributed to being the first small Earth models constructed. The size of the small globe to the left is approximately 60 percent of the present Earth shown on the right. The main limitation to accepting Hilgenberg’s globes was the purely visual fit-together of continents across each of the oceans. Vogel (1990) commented that, “...though fairly exact in several regions, the totality of Hilgenberg’s result was not entirely convincing because, especially in the Indian, Pacific, and Arctic Ocean regions, numerous gaps and overlaps appeared between continental fragments.” Hilgenberg also gave no explanation for the creation of the oceans, nor an explanation as to what happens to the present-day volume of seawater on a much reduced radius Earth. More specifically, Hilgenberg’s reconstruction across the Atlantic was considered to be convincing, however difficulties were encountered in the Indian Ocean due to a greater dispersion of the continents and an uncertain initial position of India and Madagascar. The Pacific region was the most difficult to reconstruct, as workers to follow also found. Unlike the Atlantic and Indian Oceans, where the borders of these oceans retained their shapes, the Pacific borders were considered by Hilgenberg to have opened much earlier and hence the shape of these borders remained tectonically active throughout the continental dispersal times. To explain the expansion process Hilgenberg postulated that the mass of the Earth, as well as its volume, “...waxed with time.” Because of this stance and the several problems inherent in his reconstructions, Hilgenberg’s models were largely ignored and he has since received scant recognition for his efforts. 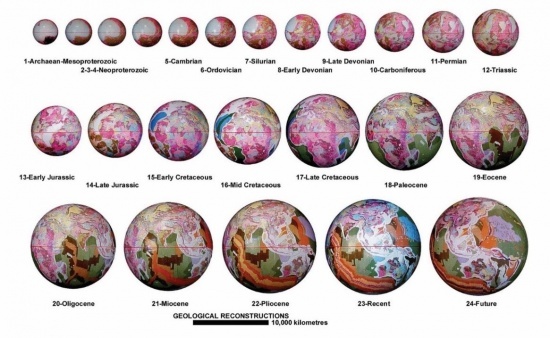 Vogel (1983) published a comprehensive set of scaled small Earth models at various diameters, including a representation of a 55 percent reassembled globe inside a transparent plastic sphere of the present-day Earth (Figure 2). Each of Vogel’s models is unique in that his work coincided with the first publication of seafloor geological mapping. For the first time, this mapping enabled Vogel to accurately constrain both continental and seafloor crustal plate assemblages back in time, without having to resort to arbitrary fragmentation of the continents or to visual fitting-together of the various crustal plates. Figure 2 Vogel’s (1983) small Earth models at various stages of increase in radius commencing on the far left with a continental reconstruction, without continental shelves, at 40 percent of the present Earth radius. A 55 percent radius model is also shown within a transparent sphere of the present day Earth at the right, demonstrating a radial motion of increase in Earth radius. This is a very important point to take note of because all previous small Earth model makers, while having enough foresight and courage to remove seafloor crusts, were faced with the less than envious task of having to visually fit together the remaining continental crusts. This visual fitting was done without the benefit of being able to accurately constrain or position the crustal fragments relative to each other. Vogel demonstrated that, in general, the continents tended to move out radially from their ancient positions to reach their modern positions and concluded that this is a "...odd coincidence for any theory except that of expansion of the Earth." On Vogel’s models, the ancient supercontinents represent an assemblage of the modern continental crusts, which agree in principal with conventional tectonic theory, however, on Vogel’s models the continents are more tightly assembled on a reduced radius Earth model. Vogel considered that development of the oceans commenced during the early Mesozoic Era—starting around 200 million years ago—and breakup and dislocation of the continental fragments was considered to be due to a widening of the oceans, centred along the mid-oceanic crustal spreading zones. Vogel went further to consider the two hemispheres of the Earth as complementary counterparts, with no need for consideration of additional ancient oceans, or to arbitrary breakup or fragment the continents, as is required in a constant radius Earth plate tectonic model. Vogel (1990) also made comment that "...an accordance of these three phenomena cannot be accidental," but must be due to "...processes operating from within the interior of the Earth resulting in Earth expansion." In addition to these observations, Vogel realized that it was theoretically possible for the continents, without their continental shelves, to fit together on an even smaller Earth globe calculated to be approximately 40 percent of the size of the present Earth. He based this observation on his comment that “...the continental shelves must have formed only after the brittle upper crust had broken into pieces.” This simple observation therefore alludes to the further potential that an increase in Earth radius process has been operating throughout earlier Earth history and has been active long before the time that historical modelling of the seafloor crusts suggests. 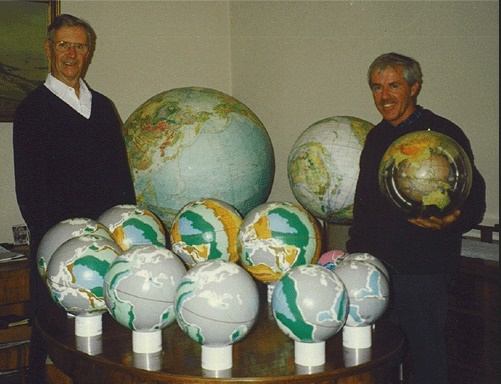 Dr James Maxlow first made his earth expansion models in 1994 by constructing the orbs from styrofoam and then hand drawing and painting on paper placed over the models. He then later photographed the orbs and used two dimensional photos of the orbs at different angles depending on the characteristics he was examining and explaining. One of the advances Maxlow incorporated into his models were color-coding for geological formations and then photographing them to plot geological, and biological plots on an expanding earth. He also made models much further back in time to over a billion years and also projected 25 million years into the future. Maxlow has studied previous globe makers involving expansion tectonics and has even met with them (see Figure 22). Dr.
Maxlow has taken global modeling to a new level with his online plotting live on the internet (see Figure 23). When comparing expansion tectonics to plate tectonics, there are some logical questions that arise given their differences. Subduction of crusts beneath continents is an artifact of the basic Plate Tectonic requirement for a static radius Earth. To maintain a Plate Tectonic static radius Earth the new oceanic crusts accumulating along the mid-ocean-spreading ridges must then be continuously disposed of elsewhere, displacing and recycling preexisting crusts into the mantle by subduction. Modern planetary studies have shown this process to be unique to planet Earth, and hence without subduction Plate Tectonics cannot exist. In Plate Tectonic theory, subduction zones mark sites of convective down welling of the Earths crust as well as part of the upper mantle. Subduction zones are postulated to exist at convergent plate boundaries around the margins of the Pacific Ocean, where oceanic and continental crustal plates converge with other plates and sink below to depths of approximately 100 kilometres, thereby recycling crust, sediment and trapped water into the deep mantle. On an Expansion Tectonic Earth subduction of between 5,000 to 15,000 kilometres of Pacific oceanic crust beneath North America, for instance, is unnecessary. All subduction-related observational data simply record the crustal interaction between adjoining thick continental crusts, and relatively thin oceanic crusts during ongoing change in surface curvature. As Earth radius increases with time the surface curvature of the Earth flattens, giving rise to crustal interaction and jostling of plates along their margins as they stretch and distort during gravity-induced flattening. On an Expansion Tectonic Earth, prior to the Triassic period, about 200 million years ago, the modern deep oceans did not exist. All continental crust was united to form a single supercontinent called Pangaea, enclosing the entire ancient Earth at about 3,200 kilometres radius – approximately 52% of the present Earth radius. Geographical studies show oceans prior to the Triassic period were then represented by a network of continental seas, with sediments deposited within continental basins masking all evidence of sea floor spreading. Exposed lands and varying coastal outlines prior to this time were similarly represented by the ancient Gondwana, Laurentia, Baltica and Laurussia supercontinents, and prior to that again by the ancient Rodinia supercontinent and smaller sub-continents. In Plate Tectonics it is generally assumed that mountain building results from collision between ancient plates as they randomly move over the Earths surface under the influence of mantle convection currents. Researchers elsewhere have therefore concluded because Earth expansion is a radial process, and hence extensional, the process cannot explain the compression required for mountain building. While seemingly logical from a Plate Tectonic perspective, it is illogical from an Expansion Tectonic perspective. As the Earth radius increases the continental crust must distort, bend, twist and turn as it continuously flattens and adjusts during change in surface curvature. During this ongoing gravity-induced crustal flattening process compression causes folding of the soft sediments within sedimentary basins, as well as faulting, volcanic intrusion and metamorphism (heating and compression of the rocks). When the continents began to break-up and disperse 200 million years ago, the edges of the newly formed continents then flexed and rose vertically to form the great escarpments and mountain ranges as the interiors collapse during ongoing changing surface curvature. This process is cyclical during ongoing increase in Earth radius, resulting in multiple and overlapping phases of mountain building, planation, sedimentation, uplift and erosion. What about past measurements of Earth radius? Palaeomagnetic measurements were first used during the 1960s to early 1970s to establish an ancient Earth radius. This information was then used in an attempt to resolve debate once and for all on whether the Earth radius is increasing or not. The outcome of this research was the conclusion that Earth radius is not increasing and this has of course since swayed popular opinion towards Plate Tectonics, without fully appreciating the implications of the outcome. While the various researchers went to great lengths to present quality data and sound methodology, it should be realized at that time there was very little agreement as to what a potential Earth expansion may or may not have been. What the researchers failed to comprehend was the significance of magnetic pole locations determined from conventional palaeomagnetic formulae. These are virtual pole locations, not actual locations. Because of this oversight they then made incorrect assumptions regarding application of the ancient latitude and colatitude to determine radius. When the Expansion Tectonic magnetic pole locations for Africa are correctly used, the palaeomagnetic data, in contrast to published conclusions, conclusively quantify a Triassic Expansion Tectonic Earth radius. This, in conjunction with the diametrically opposed North and South Pole plots, represents definitive proof in support of an expanding Earth. Space geodetics is modern technology that uses satellites and radio telescopes to routinely measure the dimensions of the Earth and plate motions of the continents to subcentimetre accuracy. During the early 1990s, when enough ground stations were established to form a global network, the global excess in radius was found to be 18 mm/year – i.e. the measurements showed that the Earth was expanding by 18 mm/year. This value was considered to be “extremely high” when compared to expected deglaciation rates during melting of the polar ice-caps, estimated at less than 10 mm/year. The researchers in fact “expected that most … stations will have up-down motions of only a few mm/yr” and went on to recommend the vertical motion be “restricted to zero, because this is closer to the true situation than an average motion of 18 mm/yr”. This recommendation is now reflected in current mathematical solutions to the global radius, where global solutions are effectively constrained to zero. These recommendations are justified from a constant Earth radius Plate Tectonic perspective. The 18 mm/year excess was considered to be an error in atmospheric correction, so was simply zeroed out. What must be appreciated is that without an acknowledgment of a potential increase in Earth radius NASA had no option but to correct this value to zero, and hence adopt a static Earth radius premise. From an Expansion Tectonic Earth perspective, however, the 18 mm/year excess equates with a present day value of 22 mm/year increase in Earth radius, determined independently from measurements of areas of sea floor spreading. Empirical small Earth modeling studies more than adequately demonstrate that an increasing radius Expansion Tectonic Earth is indeed a viable and demonstrable tectonic process. Yet Expansion Tectonics today is continually thwarted by scientists and well-meaning peer reviewers to the point where publication of any of this empirical evidence is refused by the majority of publishers. This attitude and refusal is based on the explicate assumption that Earth radius has remained constant, or near constant over time, based initially on tenuous pre-1976 palaeomagnetic evidence. This conundrum continues to remain vehemently upheld yet scientifically untested in science today. The conundrum is also unknowingly being perpetuated by refusing to acknowledge, or to even allow scientific testing of the alternative proposal that Earth radius may in fact be increasing over time and hence global plate tectonic data may be better suited to an increasing radius Earth model. By ignoring the empirical global evidence presented here and by continuing to accept any shortfalls conventional insistence imposes on the plate observational data, Dr Maxlow considers that this refusal is continuing to slow geologic progress by maintaining narrow, rigid viewpoints. This ignorance will then continue to perpetuate scientific conundrum by discouraging alternative research and convincing students and scientists alike that the main plate tectonic problems have all been resolved. Irrespective of the infancy of this solar wind-related observational data and causal mechanism for an increase in Earth mass it is considered that there is more than enough justification to at least consider that the mass and radius of the Earth may in fact be increasing over time and hence begs the question as to what would happen to plate tectonics on an increasing radius Earth model? We can no longer justify rejection of this increasing Earth mass and radius proposal in favour of a constant radius Earth model without at least scientifically testing this new proposal using modern global observational data. Validation of this new proposal would then constitute a paradigm shift in conventional Plate Tectonic thinking. The fundamental problem that scientists and the general public have when modelling tectonic data on an increasing radius Expansion Tectonic Earth is comprehending where did the huge volume of material making up the seafloor crusts and underlying mantle go to when moving back in time in order to reassemble the continents? And, more importantly, where does this huge volume of material come from when moving forward in time? From this perceived problem, historically it would seem that it doesn’t matter how unique or empirical the constructed models or data modelling are, if an explanation for these observed phenomena cannot be given to the satisfaction of scientists and the general public alike then all increasing Earth radius theories must remain rejected in favour of a constant radius Earth theory. It is fair to then ask the very pertinent question that if an acceptable causal mechanism is proposed, as palaeomagnetics did for the rejected continental drift theory during the 1950s, do we seriously consider this mechanism, test the new proposal in light of modern tectonic observational data, accept the empirical evidence in support of this proposal, and revise the current plate tectonic theory? Or do we continue to reject the observational data and acceptable mechanism and instead remain supportive of an outdated theory based on a pre-assumed mathematically constrained constant Earth radius premise? In strong contrast to what was available 50 years ago when the historical Expanding Earth theory was initially rejected, the influence of charged solar wind-related particles emanating from the Sun on the near Earth environment has only been available since the Cluster II satellites were launched by the European Space Agency in year 2000. The new space-based observational data subsequently collected has highlighted the introduction of large quantities of solar wind-related electrons and protons into the Earth, propelled by the Earth’s magnetic field, which begs the question as to what is happening to these particles—the building blocks of all matter on Earth—once they enter the Earth? The proposed causal mechanism for an increase in Earth mass and radius over time is based on, but not necessarily constrained to, the input of charged solar wind related electrons and protons originating from the Sun (Eichler, 2011; Maxlow, 2014). It is envisaged that magnetically charged electrons and protons enter the Earth’s magnetosphere and lower terrestrial layers primarily at the polar auroral zones and, to a lesser extent, as random lightning strikes during electrical storms. These magnetically charged particles are further attracted by conduction to the strongly magnetic core-mantle region of the Earth. 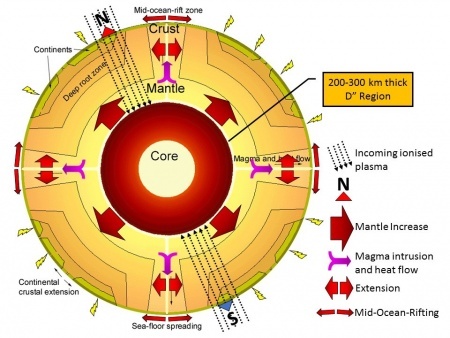 The elevated core-mantle temperatures and pressures present enable the various particles to dissipate and recombine via nucleosynthesis as new matter within the upper core or lower mantle regions, in particular within the 200 to 300 kilometres thick D” region located at the base of the mantle directly above the core-mantle boundary. Another proposed model for expansion and mass increase come from de Hilster and de Hilster's Particle Model. Similar to charged solar wind, the de Hilster's propose that nucleons of atoms combine with G1 particles (a particle that replaces the electron and electricity) to recombine into atoms within the earth. They claim that the particles mostly enter the south pole thus explaining the disproportionally larger expansion in the southern hemisphere. It is envisaged that new matter is synthesised mainly within the reactive upper core or D” region of the lower mantle which in turn results in an increase in Earth mass. This growth of new matter and increase in mass causes the mantle to increase in volume. This increase in volume is then transferred to the Earth’s outer surface crust via two primary mechanisms. Secondly, as laterally-directed crustal extension which is presently occurring on the surface of the Earth as extension along the full length of the mid-ocean-rift zones, within continental sedimentary basins, and within more localised mantle plume and igneous complex regions (Figure 23). The long-term potential effects of this causal process on the ancient Earth is summarised in Figure 24 showing a schematic cross section of three small Earth models: the Cambrian (around 540 million years ago), the Permian (around 250 million years ago), plus the present-day model repeated. 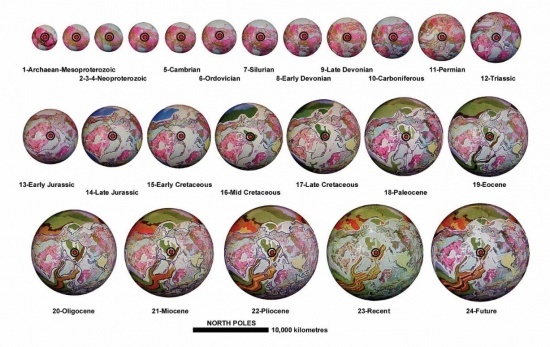 These models are all to the same scale and based on the geological small Earth modeling studies. The schematic models mark times of significant changes to crustal development. These changes include changes to the aerial distribution of ancient sedimentary basins and continental seas during ongoing crustal extension throughout the Palaeozoic Era, plus breakup of the Pangaean supercontinent and formation of the modern continents and oceans during the late-Permian. Figure 23 A schematic cross-section of the Cambrian, Permian and present-day Earth highlighting the effects of an Earth increasing its mass and radius over time. Core and mantle dimensions for the Permian and Cambrian models remain speculative only. Prior to the Cambrian model is the 3.5 billion year interval of time known as the Precambrian Eon, which represents around 85 percent of known geological history. The rate of change in Earth mass, surface area, and radius during this extended period of time was extremely small. 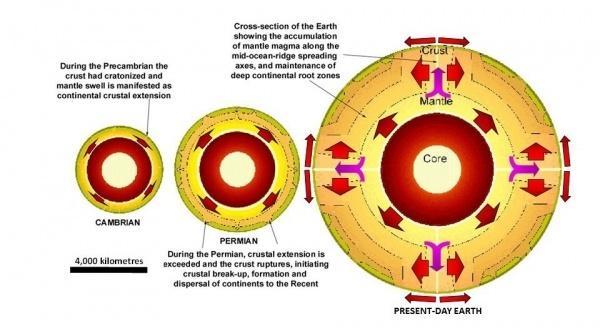 During that time, it is envisaged that matter formation within the primitive lower mantle and upper core was at an early stage of development, and the increase in Earth radius amounted to microns increasing to millimetres per annum. It is further envisaged that the limited size of the Precambrian Earth, along with the possibility of a much reduced magnetic field, may have limited the amount of solar particles entering the Earth hence limited the rate of increase in mass and radius over time. The approximately 310 million year time interval between the beginning of the Cambrian to the end of the Permian Periods is the Palaeozoic Era and on an increasing radius Earth this era represents a time when Earth mass, radius and surface area gradually increased from a steady to steadily accelerating rate of change. Again, this increasing rate of change in mass and radius may have been the result of an increasing Earth magnetic field intensity, as well as increased changes to output of charged solar particles from the Sun. 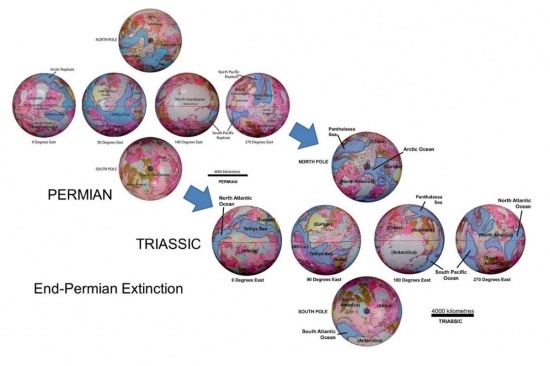 The end of the Permian Period is marked by a breakup of the Pangaean supercontinent to form the modern continents and opening of the modern oceans. The following Mesozoic and Cenozoic Eras represent a time of dispersion of the modern continents, ongoing opening of the modern oceans, and a rapidly accelerating rate of change in Earth mass, radius, and surface curvature. On small Earth models, for the first 3,750 million years of Earth history—to the end of the Permian Period 250 million years ago—all continental crusts remained united to form a single supercontinental landmass encompassing the entire ancient Earth. This supercontinental landmass was, in turn, partly covered by a network of relatively shallow continental seas. During this extended length of time the overall crustal extension and increase in surface area amounted to microns, increasing to tens of millimetres per annum spread over the entire surface area of the ancient Earth. During these pre-Permian times volumetric mantle growth was manifested at surface as an increase in surface area within an interconnected network of crustal weakness—sedimentary basins and orogenic zones. This network was first established during the early-Archaean Eon and progressively extended in surficial area over time. Continental crustal extension was focussed within this network of crustal weakness initiating formation of low-lying sedimentary basins and relatively shallow seas. This crustal extension continued unabated until the late-Permian Period when the ability of the crust to continue to stretch and extend was physically exceeded. During the late-Permian Period the ability for the crusts to stretch and extend within the Pangaean supercontinental crusts—shown as green coloured crusts on the Permian schematic model—was exceeded and rupturing of the Pangaean supercontinent was initiated. The Pangaean supercontinental crusts then ruptured and broke apart to form the modern continents and the modern oceans. The outcomes and growth history of this breakup and opening process, extending from the early-Jurassic to the present-day, is now preserved within the seafloor crustal geology shown in modern publications, such as the Geological Map of the World (CGMW & UNESCO, 1990). On an increasing Earth radius model all geological phenomena now seen at surface, such as basin formation, folding, faulting, orogenesis, magmatic intrusion, mountain formation, crustal extension, continental break-up and so on, are ultimately caused by the volumetric growth in Earth mass and radius over time. These phenomena are particularly related to changes in relief of surface curvature of continental and seafloor crusts as a direct result of the subsequent increase in Earth radius and surface area over time.